"Huwag mong bibigkasin ang hindi." Ayun, ginive-up ko muna yung book. Pag humupa na siguro yung hype sa libro baka mas mabilis na ako makahiram. 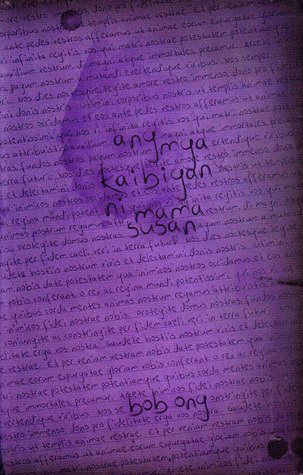 Hanggang sa napunta ako kahapon sa bookstore para bumili ng librong pang-book-review-project ng kapatid ko, nakakita ako ng copy ng Mama Susan. Dahil may extra bucks pa naman ako, binili ko na bago pa magbago isip ko. Hindi ko siya binasa agad nung gabe, sabe ko, umaga nalang para hindi masyadong creepy. Sabe kase nung ibang nakabasa at nang-iinggit (lols) e nakakatakot daw. Iba daw sa mga previous books ni Bob Ong. So ako naman, 'kay. Dahil madali akong matakot, go sa umaga nalang. Eto na yung review. Hahaha. The story was about Galo, 16 years old, Engineering student. Madame siyang angst sa buhay tulad ng dysfunctional family, failed love life at demotivated personality. Meron siyang school project na diary kung san kelangan niyang idetail dun yung day-to-day activities niya. Natapos na yung sem at lahat, nagsusulat pa rin siya dun sa notebook niya-- yun lang din naman kase yung outlet niya ng mga frustrations niya sa buhay. Yung ~creepy parts ay nung napunta na siya sa probinsya nila para alagaan ang lola niya. Madame siyang naramdaman at naranasan. Well, basahin niyo nalang yung book, hindi ako spoiler e. Hehehe. Actually, saktuhan lang yung libro. Never naman kase ako naging fan ng horror-suspense thingies. Okay so biased ako niyan. Sige, looking objectively, na-satisfy naman niya yung justified expectations ko sa story. Dahil nga horror-suspense ang genre niya, meron naman siyang fair share ng creepy moments, although hindi ka naman magkakaron ng isasara-ko-muna-yung-libro-kase-kinikilabutan-ako moment. Sakto lang. Plus, being Bob Ong, I expected some sort of underlying messages or themes na gusto niyang iparating. I was able to grasp them naman kaso parang kulang sa tieback yung kwento o dahil cliff-hanger lang yung ending. O yun. Madameng tanong na maiiwan sayo after reading the book. Baket maraming secrets si Galo? Ano kaya yun? Sino kaya yung babaeng tinutukoy niya sa mga rap entries niya sa diary? 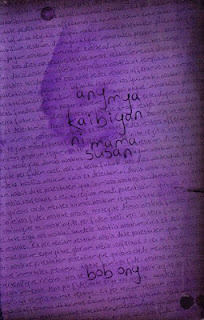 Totoo kaya yung mga "pasabog (Fermin, eternity)" ni Mama Susan halfway thru the book? Ganon din kaya nangyare kay Tinay? Si Niko kaya gumaling? E si Jezel? Basta may mga ganyang loose ends at makukunot nalang noo mo kase wala sa libro yung sagot at kahit dun sa mga Latin prayers na nakalagay sa entries ni Galo. But then again, nasa style siya ng pagkakasulat ng libro. Dahil diary-entry style siya, malamang hindi lahat maisusulat ni Galo yun o ng kahit na sino. Hindi mo naman kase kayang idescribe lahat ng feelings o emotions na nararamdaman mo at the moment. Madalas, words won't really be enough to encompass all of them (oha!). Kaya siguro hindi na naituloy pang ikwento ni Galo yung mga nakakakilabot na nakita niya. Hindi niya na rin naipaliwanag pa o nasabi yung mga sikreto niya sa buhay. Human nature na siguro yun-- i-conceal yung mga bagay na gusto mo nang kalimutan o ni-re-regret mong nangyare sa buhay mo. Kase nga kulang ang salita para ipakitang nasaktan ka sa pangyayari o nagsisi ka na sa pagkakamali mo o hindi mo na kaya pang balikan yung kahihiyang naranasan mo. Ganun siguro yun para kay Galo, kaya solb na na mabasa naten yung raps niya at reklamo niya. Sasapat na yun. Ganun ka din naman. Ganun din ako. May varying themes din na sinubukang bigyang-pansin sa libro-- organized religion, faith in a higher being, technology at end of the world. Halos lahat si Mama Susan yung nagbigay ng paliwanag dito. Strong yung words ni Mama Susan dito-- riveting and true. Binigyang diin niya yung masyadong pag-depend ng tao sa technology-- kahit gano nito kayang padaliin ang lahat, madalas ito pa ang mitsa ng buhay naten. Para sa kanya, mabilis magoyo ang tao at madali ding makalimot ito. For one, gugustuhin mo lahat ng bagong gadgets kase dadali lahat ng ginagawa mo, nakalimutang kaya siya may paa at kamay e para gamitin sa paggawa. Akala niya nakakuha siya ng mga alilang robot, pero ang totoo, unti-unti na siyang inalipan ng kagustuhan niyang kamtin lahat ng magagandang bagay sa mundo. Pinakita ni Mama Susan na maraming magagandang bagay na ibibigay sayo kung mananatili kang payak at kuntento. Para sa kanya, masyadong maraming hinahanap ang tao samantalang kapag nagdasal ka at tumingin sa paligid mo, andun na rin naman yun. Mahalaga para kay Mama Susan ang Diyos. Marami na ang nakalimot sa kanya pero gumagawa siya ng paraan para makita mong anjan siya. Marahil tayo si Galo, madameng hinahanap sa buhay. Madameng angst. At yung sarili nating konsensya si Mama Susan, gusto tayong ibalik dun sa simpleng explanation ng mga bagay-bagay na ginagawa nating kumplikado. Madame siyang gustong sabihin, ipaliwanag. Kaso lage tayong takot i-confront, pakinggan, kase alam nateng kahit masasakit ang bibitiwan niyang salita, totoo yun at kelangan nating baguhin, once and for all. Pero well, madalas ayaw naten. Iiwas. PS: Binasa ko yung mga hindi ko naintindihang Latin phrases. Wala namang naganap. Tatry ko ding iGoogle Translate baka may meaning talaga yun. Last Friday's Miting de Avance for the Central Student Council Elections had been a regular fanfare for PUPians. There were two colors-- the Reds and the Yellows, both elbowing their ways to the heart of the well, "voters" or their constituents. There were 20 something candidates for the SC positions, i.e. councilorship, vice presidency and presidency. Both parties were introduced by their feisty campaign managers, each statement loaded with puns and "patama". And then there were the "groupies" or yeah right, their "supporters". To add some spice for the event, there were chants and yells shouted at the top of their lungs; there were the usual catcalls, and then there were also the not-so-usual, yun na nga yung mga pasaring at patama. Hahahaha. After the "show", the candidates proceeded to their speaking opportunities. They were allowed to speak for a few minutes, around 3-5, just to lay out their platforms for governance. And well, their platforms all had recurring and obvious themes: student empowerment through involvement and interaction, a push for a better quality of education through academic excellence, social awareness and a call for a higher budget and advancement of the interests of all sectors involved inside the campus most especially the students. I strained myself to listen to what both sides would have to say. After all, it is my duty to do so as a student; but more than that, it is what is expected of a Political Science student. I have to understand what they want to say and from that look at which perspective they are coming from. It is also expected of me to discern what they are saying and examine if they are really telling me the truth or they're just feeding me lies and empty promises. Let us take a look at their supposedly "platforms for governance". The Yellows' banner statement is Academic Excellence. They are premised on the idea that students should be students, they have to study, participate on a few extra-curricular activities and take part on issues concerning students primarily. Issues like tuition increase, budget cuts, added facilities and improved quality in education, according to them, could be solved through more "rational" means. They tell us that if we choose to study and excel in our classes, we'll be able to graduate in time, find the right job-- with good pay and fat benefits-- and pay our taxes regularly and correctly. These taxes are government revenues used to fund the education of our fellow Iskos and Iskas that could help them get more facilities and in effect achieve a better education. That's simple logic. :) On things like budget cuts and tuition increases, they argue that issues could be settled on by sitting on the table, talking and eventually smoothing out the differences the affected parties has. That could be a good point. Now the Reds tell us that they too would want to empower students but on a different approach. They go for "militancy" (that's how I perceive it's called). They see that students go to school because they have to study not just their basic subjects and chosen courses but also on how the society works. They view academic excellence as a balance between studying within the four walls of the classroom and going outside our zones to understand the plight of the people who make our studying possible-- the "small and landless farmers, farm workers, fisherfolk" (TY MDG handout. hehe) and the members of the working class i.e. migrant workers, factory workers, our parents really. We're going to be like them someday, working our asses off to put food on our tables, so we have to help them fight for their rights, in that way we lend a hand in shaping a better future for every one. Hence, the rallies and protests and the alternative classes. This could be good too. But wait there's more. From the point of view of an average reasonable person, I see the flaws on plan. First off, you tell us of academic excellence and all-- passed exams, no flunked classes and a healthy class record. There may be professors with problems on work ethics like those who frequently absent, those who just guess the student's grades and those whose agenda in life is to powertrip. There really are plain bad professors and instructors. But there are also the better professors, those who really prepare reading materials, those who teach students what they should know and those who do not copy exam questions from the internet (as if we don't discover what you are doing. hahaha). And yes, we have to deal with them no matter how difficult it could be. From them, we are able to understand the real value of learning-- we are pushed to do our best even if they don't come to class and even if they don't teach. We won't be absent in class just because we see our prof's ineffective or because we got drunk last night. We would choose to take the quiz even if we're not prepared and we expect to fail because we know that it is our primary responsibility to study. So don't go telling us you are the better bunch because you go for academic excellence when you choose to do the non-important stuff. I'd rather be seen on the streets fighting for a cause than be sleeping on the couch because I got tired from the "inuman" sessions last night. Walk the talk. But second, explain to us what have you done to empower the students. Tell us, in rich detail, how you are able to flesh out participation from the students "when you cannot even empower them enough (Wong, 2011)" to stay and listen to what you have to say that night. You brand yourselves as leaders when you cannot even command them to listen to what good things you have stored for us, that is, if you really have something good in store for us. hahaha. It is called a platform for governance not a platform to mudsling your opponent or a platform to show off your achievements because to tell you weren't an inch to what you should achieve as a student leader. You have to encourage us to take part in student activities, you do not expect us to look for you and ask for activities. You, as student leaders, would have to seek us out and make us feel involved. When you are able to do succeed in doing that, that is where interaction begins. Hence the term, participative democracy. This goes for both sides, just so you know. Our "student leaders" do not seem to identify the value of representation. During the event, the only people who listened to you were your fanbases-- the people who belong to your own org. How about those who are not members, those who are plain students? There were candidates that night, around 20 I think, people are thick on the grounds but when you look up, you are talking to either empty railings or your classmates who throw confetti on you (like duh. hahaha). Those present weren't even the majority of the PUP student population, heck, they're just ten per cent from my estimate. And you dare call them the represented lot? No. Not even that close. You intend to be our leaders but you cannot even stand on your own and find a support base that is really coming from the mass constituency. If you only rely on your fellows and not on us, the greater lot, then you are just THEIR leader, not ours. The simple activity called Miting de Avance is a litmus paper to test your rapport to the students-- how you will be able to connect to them and make them listen to what you have to say because just like King George VI in the King's Speech, you too have a "voice". So we should not be wasting our time listening to gibberish and plain nonsense when you can tell us more. And yes, we expect more even if you are not able to win the elections. Public service is not exclusive to position or the SC Elections, it goes beyond that. **To those who will be "anointed" by the mandate of the studentry, we expect that you employ public service and student service at its finest. I believe that this criticism is constructive enough to help improve the level and quality of service you provide to your constituency. To the not-so-fortunate candidates, may you be humble to accept defeat. Take it as a realization that you have to do better than the effort you gave. You may be too airy to see that you are not being true to what you are trying to fight for. Debate taught me to share my thoughts and be vigilant on what is happening around me. But more than that, it also taught me to look at things on a broader perspective, to listen to the other side because like me they also have something "good" to say and to speak with courage even if opposing people won't approve of it.